What is The Lightest Baby Car Seat? Your baby car seat will likely also serve as your baby carrier for the first months of your baby’s life. While your first priority needs to be for baby’s safety in the back seat, you must also be aware that you’ll be carrying a portion of the car seat with you while visiting friends and family, running errands and transporting baby to appointments. Below are suggestions for baby car seats that will keep baby safe and make it easy to carry your baby wherever you need to go. The 6.5 pound Evenflo Nurture DLX Infant Car Seat is well-suited both for car transport and for easy baby carrying. This flexible unit comes with a permanent base that you can leave in the car as well as points to connect to your car’s seat belts. Be sure to follow all manufacturer’s directions about installing the base or buckling in the baby seat directly, including instructions on clearance at the top of the seat for baby’s head. Multiple bases available and seat belt attachment points if necessary. This car seat is only for infants and tops out at 22 pounds. You will need to purchase another car seat early in your child’s life. Sun shade is very short and doesn’t offer proper coverage. Some users find that snugging down the base causes anchor points to crack or break. 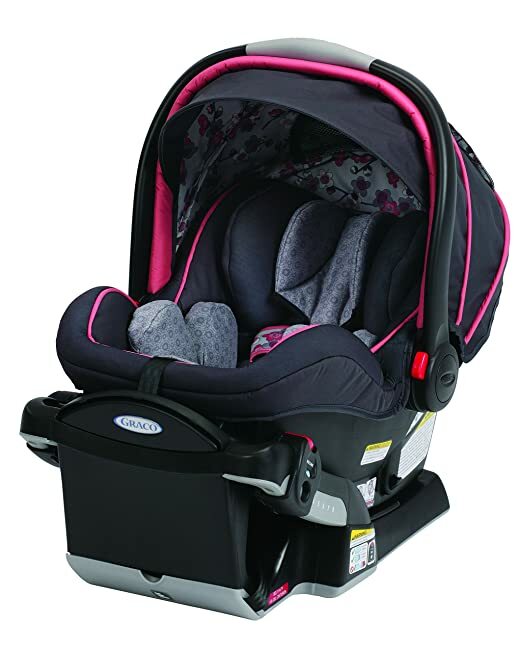 The Graco SnugRide Click Connect 30 infant Car Seat offers new parents a great deal of flexibility and is only 7 pounds. This car seat is rated for infants from 4 pounds to 30 pounds or 30 inches, so you can use this from the day you leave the hospital and for months to come. The Graco SnugRide 30 must be used with a semi-permanent base that will need to be belted into your car. This carrier will snap easily into position in the base. It will also fit in the Graco stroller, making transporting your baby easy and safe no matter where you need to go. All of the cushions are machine washable. Plastic and metal portions of the car seat can be cleaned with soap and water. It’s recommended that you only clean the buckle with a damp cloth. Plenty of time for your child to grow into this car seat. You have to snug up the belts that hold the baby from the back, so once the seat is in the base there’s no chance to adjust this without pulling the car seat out of the base. Adjusting the canopy can be a challenge as it’s tight to the car seat. The 7 pound Graco SnugRide Click Connect 30 LX Infant Car Seat also clicks securely into the Graco stroller line. This car seat is only 7 pounds and offers a front adjust harness to make it easy to secure baby in the seat from the front. In addition, the Graco 30 LX offers a 3 position base for convenience when settling baby inside your vehicle. 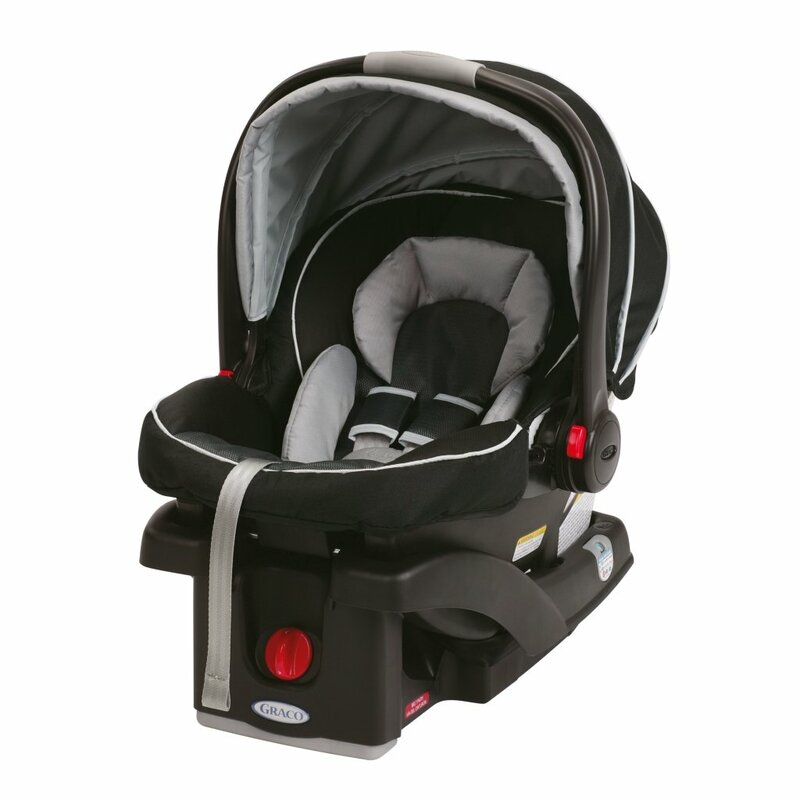 In addition, this adjustable base will make it easy for you to prop baby up a little higher when they’re ready to see outside, keeping your little one happier on road trips. Front adjust baby strap makes it easy to snug baby down safely into the seat. 3 position adjustable base grows with baby and makes it easy for them to watch the world go by. This unit can be attached to your car via seat belt if you don’t have room for the base. You need to use the wedges that come with the base to change the angle of the seat. Some parents find the canopy doesn’t easily clear the handle. 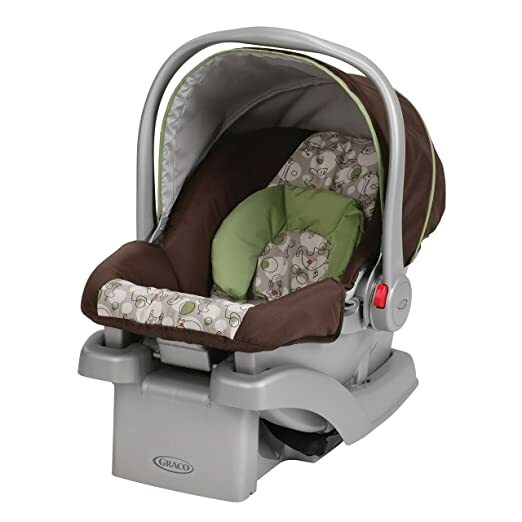 The Graco SnugRide Click Connect 35 is a great choice and will keep your baby comfortable and safe for many months. This unit is rated up to 35 pounds and for children up to 32 inches tall. There is a front adjustment strap to make it easy to snug your baby in place once the car seat is installed. The 7.5 pound SnugRide 35 comes with a removable infant insert that provides support for infants as small as 4 pounds. This can be removed once baby is strong enough to hold up their head. All of the cushions in this versatile car seat are machine washable and the plastic and metal portions can be easily cleaned up with soap and water. Do not soak buckles. Lots of places to adjust this car seat for easy and safe transport. Rotating height adjustments makes it easy to for baby to see outside and stay engaged. The button to free this car seat from the base has a close tolerance for safety, but it can be hard to get this seat free of the base. Some users find the canopy bumps the handle. 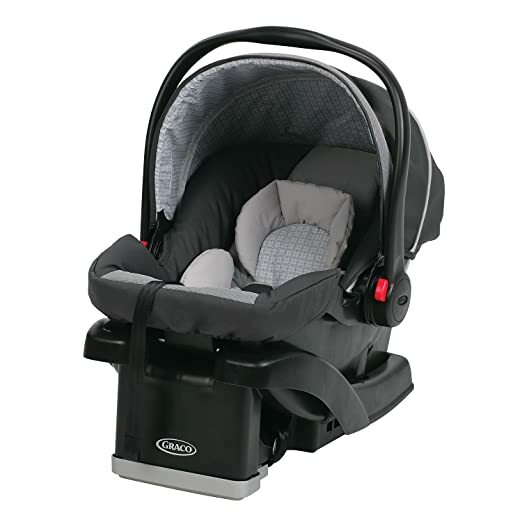 With the 7.5 pound Graco Snugride35 LX Click Connect Infant Car Seat available, your baby will travel safe for several months! 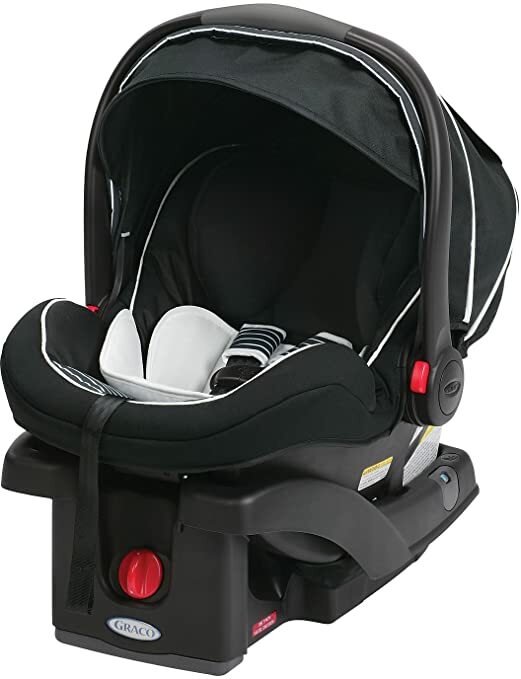 This carrier offers multiple adjustment points, including a sliding headrest that can be adjusted up as your baby grows. There is also a foam insert to support your newborn. Highly adaptable seat with plenty of options for your growing baby, crash-tested design offers great safety in side impacts and seat angle can be easily adjusted once baby is in the carrier. This carrier features several bright yellow warning stickers that can be jarring to the eye and not easily spotted in the marketing photos. Some parents find that infants in the seat are too severely reclined for comfort. The padding can get quite warm and may cause some discomfort for baby. The Graco SnugRide Click Connect 40 Infant Car Seat is the largest infant car seat in this review, coming in at 9.6 pounds. However, this seat offers comfort and protection to children from 4 pounds to 30 pounds and up to 35 inches in height. For newborns, there’s a foam insert for optimum support that can be removed once your little one is both larger and stronger. This crash tested baby car seat has a sliding padded headrest that can be adjusted from the back to provide plenty of space as your little one gets bigger! 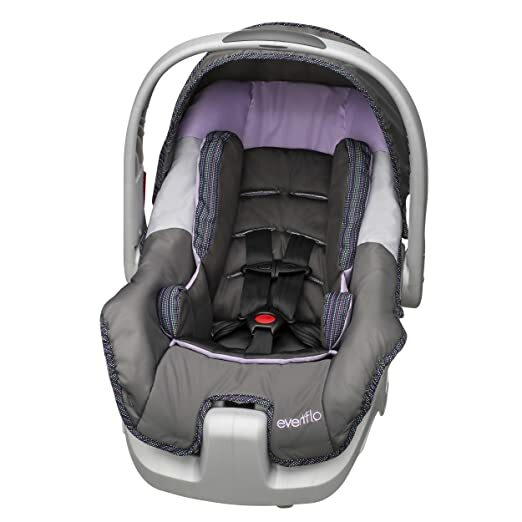 Plenty of flexibility as baby grows, easy to adjust both the headrest height and the seat angle. Connects easily to the Graco Click Connect Stroller. This is a big car seat, so if you need to push both front seats back all the way, this seat may not work for your family. Some babies find the cushions get too warm. Some parents find the canopy is tight and hard to work with or remove. Car seats make it much easier and safer to transport baby, and removable car seats with click lock technology make carrying baby a much simpler process. When investing in a car seat, be aware that this technology is constantly expanding. While it may be challenging to learn the installation process and adjustments of getting baby safely into a new car seat, purchasing this advanced technology will greatly improve the safety and comfort of travel for your little one.